This beautiful little flower is about 2-3 inches tall. It grows from tiny bulbs (culms). In the fall the green leaves come through the soil and stays that way all winter, creating a carpet of green. 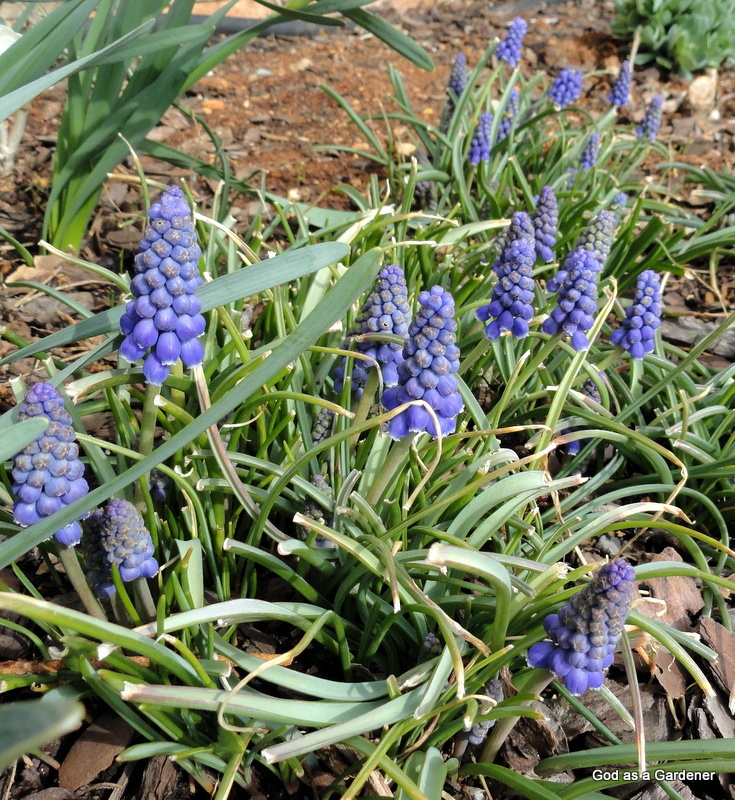 Spring (April in southwestern Virginia) brings a plethora of light blue to purple flowers. Flowers are fragrant. You will notice that some leaves and even some stems look chewed on. Blame the deer; deer foraged everywhere this winter. Should I be annoyed that deer ate my hyacinth plants? Or should I be happy that I had them available for deer to eat? I don’t know the answer to that question, do you? Originally, a hyacinth was a precious stone that ancient people called the sapphire. Hyacinthus orientalis is native to the Mediterranean region. I didn’t plant any hyacinth in St. John’s Bible garden, because the hyacinth isn’t mentioned in the Bible; however, they naturalized over winter in the grass in front of church garden beds. Possibly, some tiny bulbs were carried in plants transplanted from home to church. That leads me to think about volunteers. If you are a gardener, you are familiar with the word “volunteer” from your garden. Weeds continually volunteer in the church Bible garden plots. When we volunteer, we initiate or take on a task. My husband and I volunteered to plant and maintain the church Bible garden. We get a lot of compliments on it and we even received a national award. But, I have to admit that sometimes volunteering to maintain the church garden just seems like work. I’s a little worried about my attitude. If I volunteered to plant and maintain the Bible garden, should it seem like work? Should I resent the time it takes? Or should the gardening be joy? I am going to have to spend time in prayer about my thoughts, emotions, attitude. Reflection: Do you think carefully of the time involved before you volunteer for an activity? If your volunteer effort something particularly at your church, you should follow through; at least I think you should. Love to read your input.